I don’t think that I have ever done a “currently” post but it seemed like the best theme for today’s week in review. I have been writing NONSTOP for the event industry work that I do to the point where last week felt like one long day. Good thing I enjoy what I write though, it really makes all the difference. I still found time to write 6 posts last week here on the blog. It’s relaxing and mentally rejuvenating to keep my blog writing up while writing so much in other places. I find that it helps my brain keep the balance and creativity going (which I mentioned last week too). Quirky Eating Habits or Disordered Eating – I am a little bit behind on responding to comments but I hope to get to them today. Friday Favorites – I meant to get over to the Pure Barre studio this weekend to see if that had that cute Pure Barre love shirt but I never made it there. 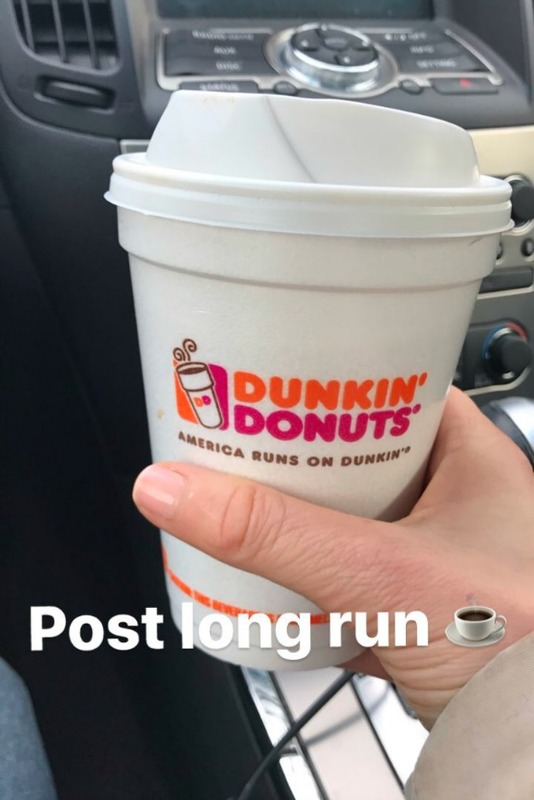 Workout Recap – It was a quality over quantity workout week and I am still especially proud of my long run on the treadmill! I am all caught up with Girlfriends Guide to Divorce and oh boy are things getting technical for Abby and the baseball team! I am loving where the series is at right now, who else is watching? I also caught a few episodes of Altar’d. Have you seen it? What do you think? And Khloe has a Revenge Body show going on now too. I watched one episode and I liked the girl who worked out in the ballet studio! Not an easy bag to find! Lately the trend has been those phone case bags that hold some credit cards too but where would I put all of my necessities? 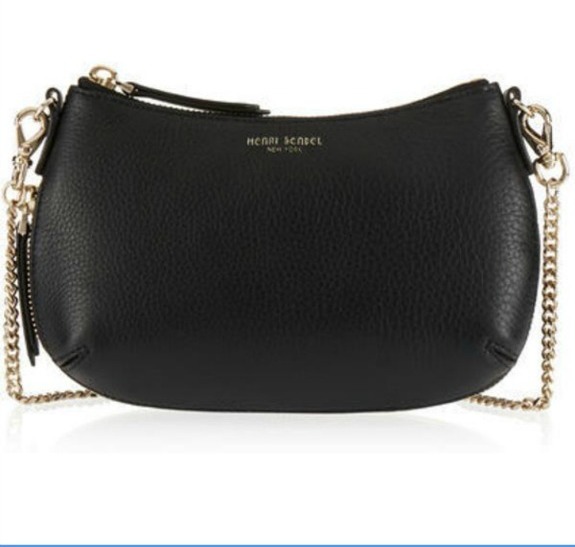 After a careful search, I finally decided on this Soho Mini Chain Crossbody Bag from Henri Bendel (no surprise here, Bendel is my favorite store lately). For the price and functionality, I think this bag is perfect. I will be using it tonight for the first time at a work event in the city! Still obsessed over here with the cinnamon vanilla Yogi tea. I refill my mug all day long and this time, almost overflowed it. 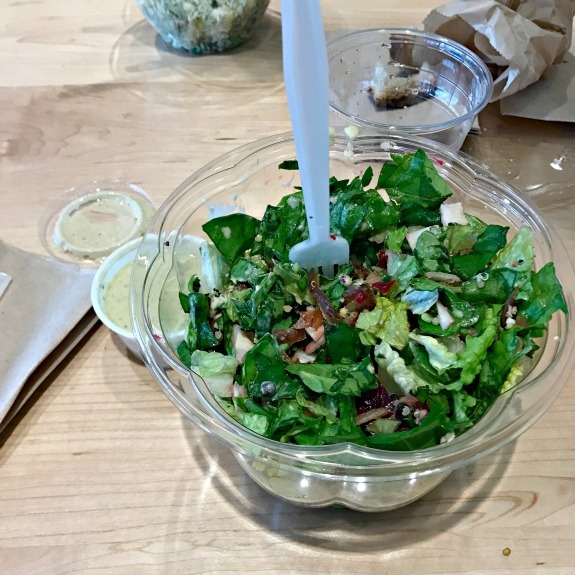 We still like going to Chopt for salads and my favorite dressing right now is the spicy tahini. 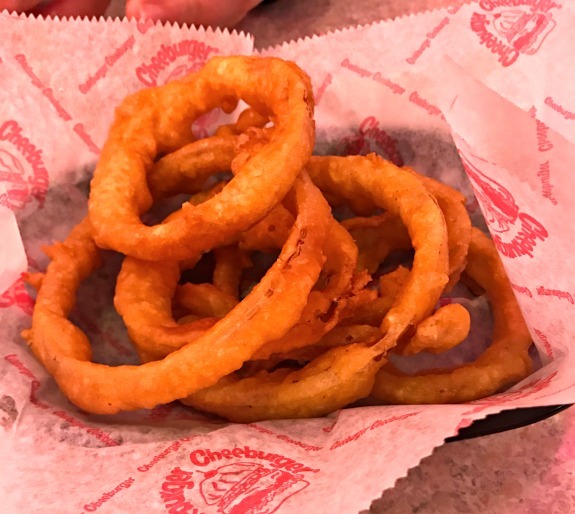 I never shared a picture of the onion rings we had when we went to Cheeburger Cheeburger the other night. These onion rings were a little greasy for my taste but still good. We had lunch at Morrison’s yesterday. I have been to Morrison’s a few times in the past but this time was just okay. The service was super slow and the salad that I was finally able to order came out wrong. 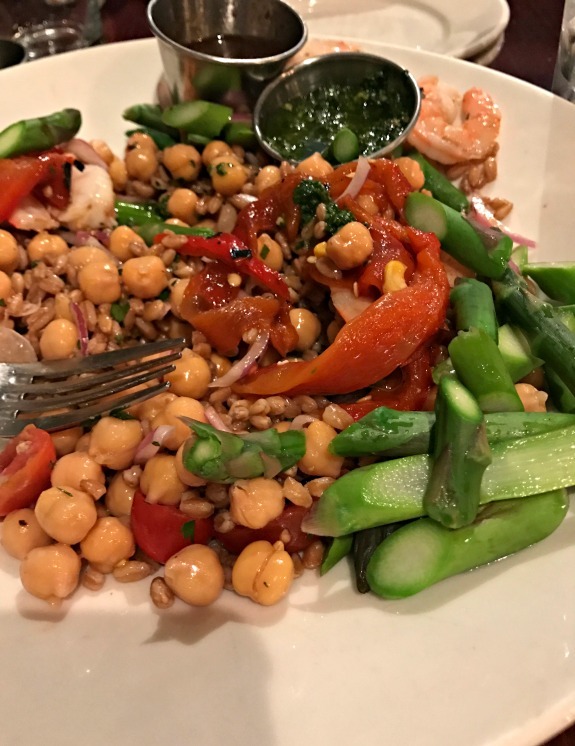 I believe I ordered the Gypsy Bowl which was to contain chick peas, farro, roasted peppers, tomatoes and asparagus. Somehow, it was missing the vegetables and arrived with shrimp. The shrimp part really confused me. Of course I sent it back for the vegetables to be added! It was just okay. 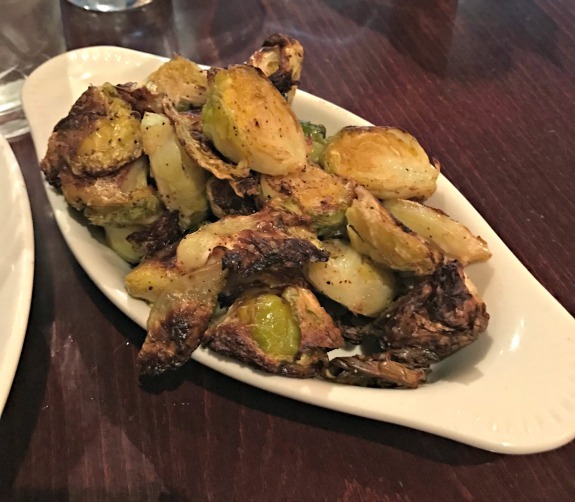 The roasted brussels sprouts were really good though. And, most importantly, Cold Stone had cookie dough back in stock as a topping this weekend! Finally. What shows are you watching on television right now? That bag looks perfect! I always end up carrying a bigger purse than I would like to make sure I can fit all my stuff in there. Im happy for you that the cookie dough is back! That ice cream looks amazing. That purse is so cute! Cross body bags are my favorite. I have a small one for just the essentials and then a larger one if I ever need a full size purse. Tahini dressing is my favorite as well right now! Yay for the cookie dough! We drove down to Whidbey Island yesterday (in the States, about a 2 hour drive from here) and hung out on the beach and then drove south another hour or so to Red Lobster near Seattle (we don’t have Red Lobster up here). Callum was a bit restless, but downloaded shows from Netflix saved us on the ride back home. We stopped at Target (we don’t have THOSE up here either) and got a really nice area rug! Yum cookie dough ice cream! I made chocolate lava cakes and paired them with raspberries and vanilla caramel ice cream, cookie dough would have been delicious though! I’m glad Cold Stone has cookie dough again. Hopefully it made up for the wrong and just OK salad. 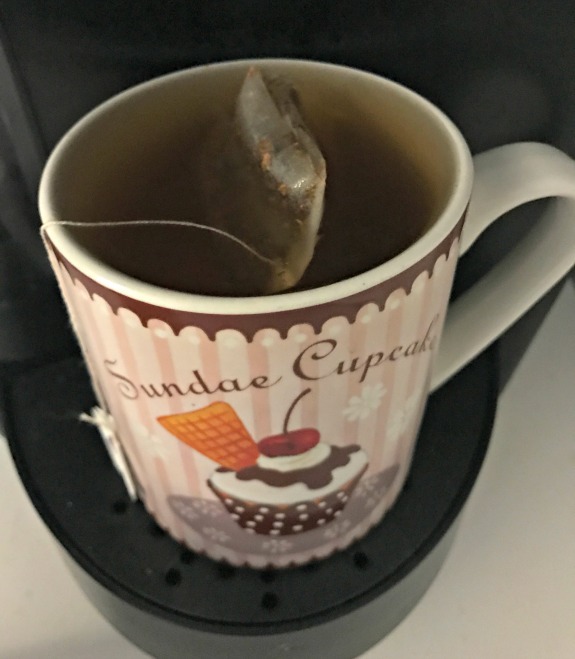 I’m behind on my TV shows lately and my blog reading. I still want to check out your disordered eating posts. I always enjoys those ones from you, and I’m amazed at all the writing you’re doing. Send me some of those vibes please…or maybe just sleep for the baby so I can actually write during the daytime when I’m somewhat coherent. She’s working on her fourth tooth now!! I’m a huge fan of cinnamon vanilla and I know how attractive it is :). That bag looks so lovely, I will need the same one which i can put some make-up stuff and hang out with my boy friend :D. have a nice day!! Current show: The Crown on Netflix. It makes me remember Queen Elizabeth was a girl once! Best thing I ate all weekend: vanilla bean caramels from a candy shop in a tiny town in the middle of nowhere that my husband and I stopped at on our murder mystery train ride. Obviously the atmosphere made it that much sweeter (pun intended). I must watch that show! I used to read the historic romance novels from Philippa Gregory! Love the bag – I’m still sort of hunting for the perfect mid-sized bag but probably going to wind up waiting until my current bag is completely trashed before splurging on a new one. I’m way too indecisive with bags! I’m so indecisive too but i really needed a new one in this size! i am glad i finally bought it. I love the style of bag, I have this one: https://www.pinterest.com/pin/200973202096997388/ And its the best. Did a indoor golfing simulator, plowed and shoveled snow, plowed and shoveled more snow!! Im currently watching limitless. 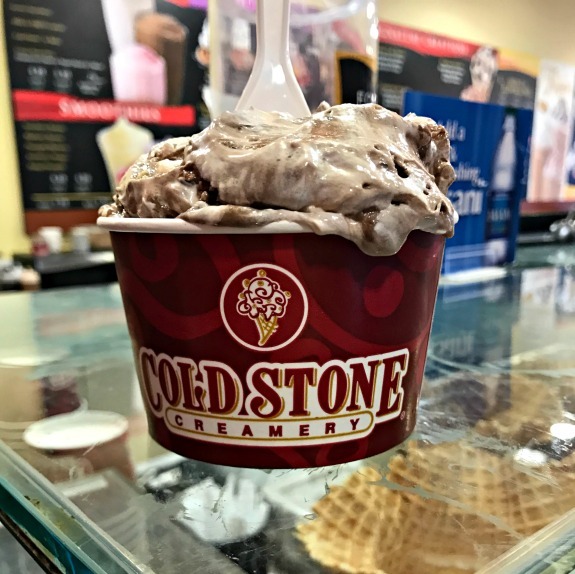 Coldstone-yum! I bought an adorable rectangular tiny black leather crossbody bag from a Kate Spade Outlet (on sale!) in September that has been awesome. It has enough room to just hold everything I need and has held up nicely as well as looks nice enough for day to day or fancier occasions. This weekend we hosted a birthday party at my house and roasted a whole pig in the yard. There was also Funfetti Cake, made my yours truly. It was all amazing.